Rutger the cat died at age 21. 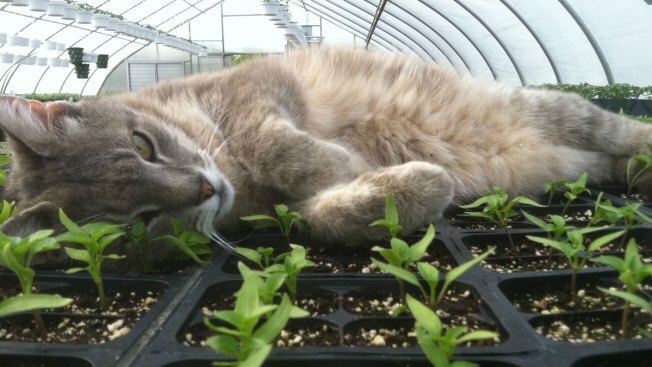 The cat that was a fixture greeting visitors at New Jersey's Rutgers Gardens has died. Rutger was 21 years old. Horticulturist Monica McLaughlin told the Home News Tribune she was with Rutger when he died on Monday. McLaughlin said she and another volunteer knew it was time and they held him and sat on the grass with the sun shining on him. "To think he made it that long. He had a great life," McLaughlin told NBC. A photo of Rutger the cat at Rutgers Gardens. The gray tabby spent his life controlling the mice population at the gardens in New Brunswick. However, Rutger went missing in 2014 when a woman took him to make him her pet. McLaughlin said it did not work out and the woman set him free about two miles away. He was spotted outside a home where a person was grilling salmon. McLaughlin said Rutger wasn't the only cat to take up residence at the Gardens and mentioned another feline named Luke. "I just hope he'd venture out of the greenhouse area more," she said.